The vice-chancellor of Sri Jayawardenepura University is a bootlicker of Minister S.B. Dissanayake and he is engaged in destroying students’ lives to gratify the Minister says the National Organizer of the Socialist Students’ Union (SSU) Dr. Nalinda Jayatissa. Medical students struggled against this sordid act. They held a protest march on the 5th. 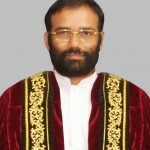 Minister S.B. Dissanayake has seen the protest march while he was going somewhere. Angered by what he saw, he had sent the vice-chancellor to scold the students in indecent language. Without stopping at this 21 students, including the office bearers of Students’ Council of the Faculty of Medicine, have been suspended. Not only medical degrees SB Dissanayake will sell Katubedda Engineering Faculty degrees also to Foreign students from 2012 A/L batch unless the Vice Chancellor of the Moratuwa Uni stand firm.